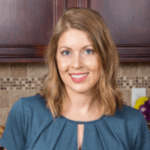 Published: Jan 18, 2018 · Modified: Apr 11, 2019 · By Jen Sobjack · This post may contain affiliate links. 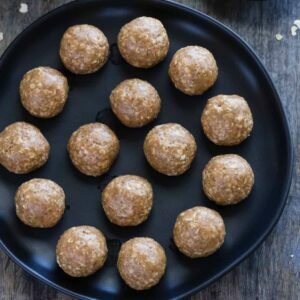 No Bake Almond Butter Balls are a great snack option! Made with only four ingredients, they taste sweet and you can feel good about eating them. I often like to have healthy, easy to grab snacks on hand. Do you remember those peanut butter bars they used to sell in grade school? I was addicted to those things. And now when I look back on it, all I was really eating was massive amounts of sugar and peanut butter. 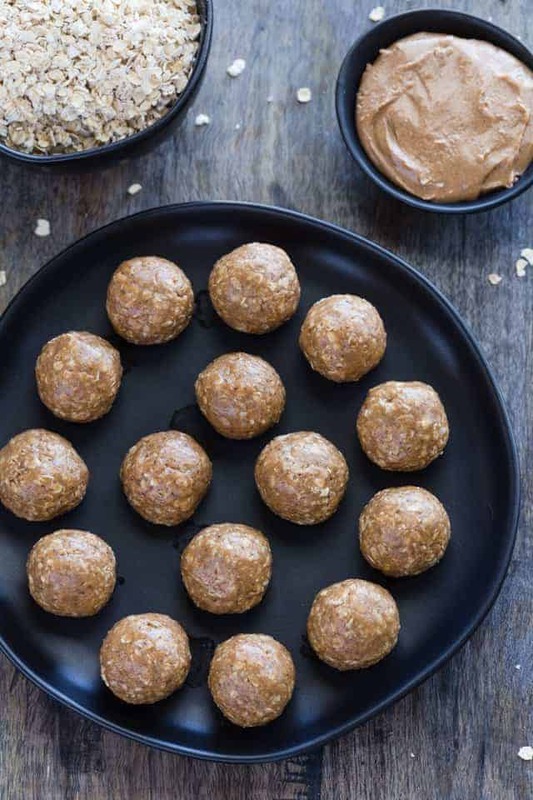 I made these little almond butter energy balls over the weekend and they reminded me of the peanut butter bars but without all of the sugar. So now when I want a snack reminiscent of childhood memories, I can make these. At least this way I can control what goes into them and have a delicious, healthy snack. 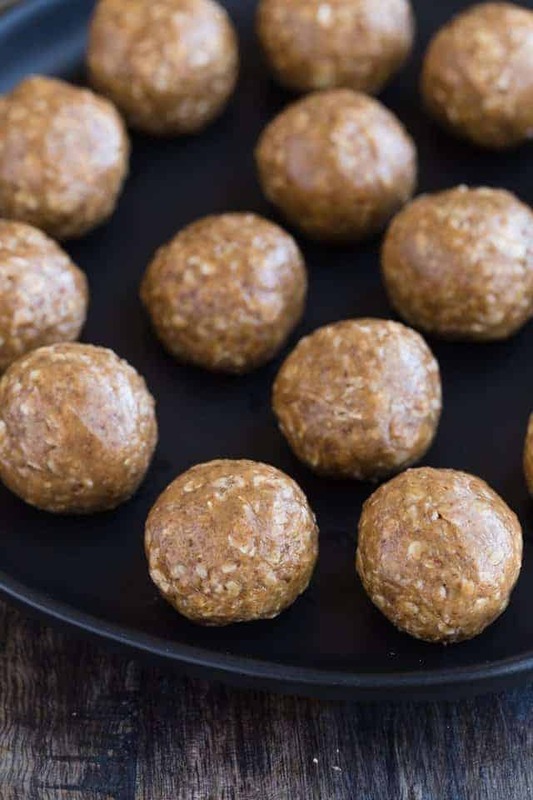 These almond butter protein balls are sweetened with honey, are gluten-free, and contain only four ingredients: almond butter, oats, honey, and ground flaxseed. However, make sure your oats package states “gluten-free”. Yes, oats are naturally gluten free but they do risk cross-contamination during transportation and processing. Most companies that process oats also process wheat. Just be sure you are getting your oats from a reputable gluten-free source and you should be fine. I’m not always the healthiest person, but sometimes your body will let you know when you need to lay off of the refined sugars and complex carbs. I was beginning to feel like a slug! It’s not a very good feeling at all. All you need for this recipe is a mixing bowl and a silicone spatula. I used this almond butter. If you haven’t made it then you will need to or you can use the store-bought kind. It’s up to you. 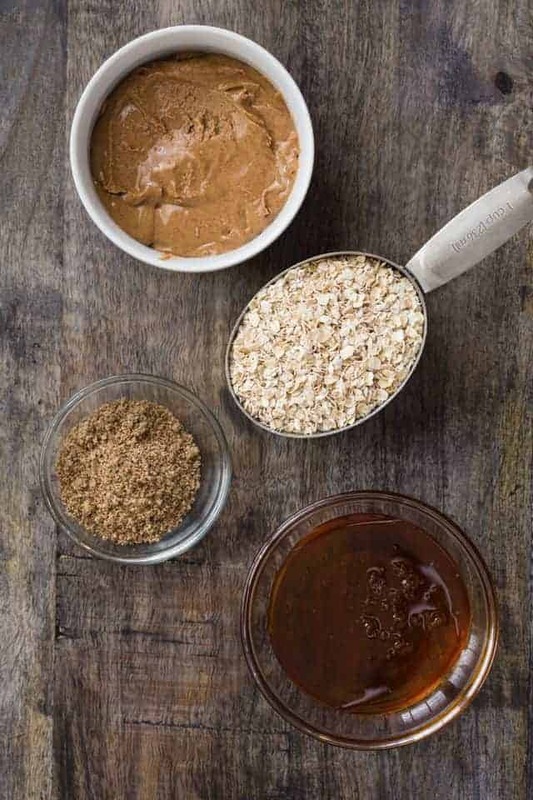 Mix the almond butter and honey together in your mixing bowl. Once it is thoroughly combined it should be fairly smooth and creamy. Stir in the ground flaxseed. My supermarket only sells whole flax seed so I had to grind it myself. If this is the case for you, only grind what you need at a time because flaxseed goes bad quickly once it is ground. You can use a coffee grinder if you don’t own one of those special flaxseed grinders. I used the single serve cup for my Ninja Kitchen System and it worked quite well. The last ingredient is the oats. This will take some arm power! Once the oats are added in the mixture becomes extremely thick. 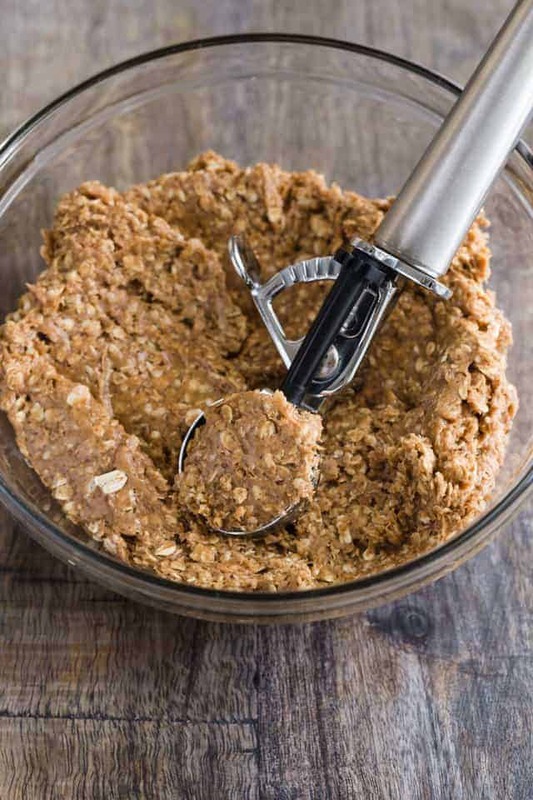 Work the oats in as best as you can to get them evenly throughout the mixture. Once everything is all mixed up, roll the mixture into one tablespoon-sized balls. You should be able to get about 17 balls out of this recipe. 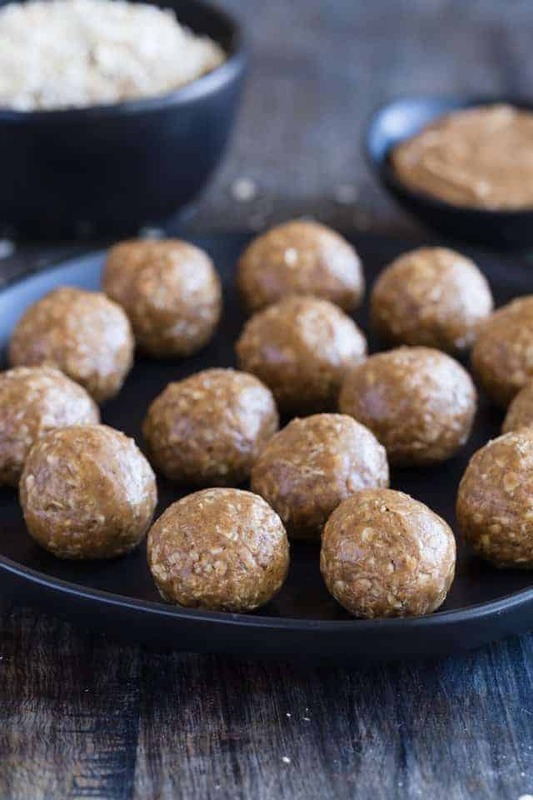 Refrigerate the almond butter balls for 30 minutes prior to serving. They will keep for one week in an airtight container stored in the refrigerator. In a medium-sized mixing bowl, stir together the almond butter and honey. Add the ground flax seed and then the oats. Mix well. Roll mixture into 1 Tbs sized balls and place on a platter or pan lined with wax paper. Refrigerate for 30 minutes prior to serving. Store in an airtight container in the refrigerator for up to 1 week. If you can’t find flaxseed meal (ground flaxseed), you can grind whole seeds in a food processor.